A horny British guy? What is this, Austin Powers? Trained to be a Watcher since childhood, Rupert Giles would become one of the most important and effective Watchers in the world thanks to Buffy Summers. At times harsh and demanding, Giles' lessons may have been hard-learned - but they were definitely successful in perparing Buffy for the challenges she would later face. Now one of the last surviving Watchers, the task of locating and training an army of Slayers falls to him. 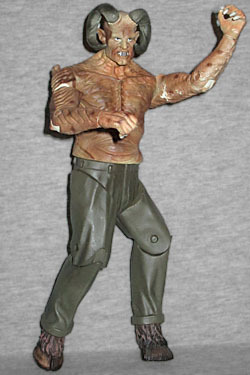 If that bio seems somewhat unconnected to the figure we're reviewing today, there's a reason for that: when Diamond Select took over making the Buffy figures from Moore Action Collectibles, they did them in character-themed series, rather than random selections. So instead of, say, three or four characters with one variation apiece, DST's featured lots of variations of two characters at a time, split among different retailers. Series 9 only comprised Faith and Giles, but there were four different versions of both of them - including this Previews-exclusive "Demon Giles." In the Season 4 episode "A New Man," Giles' old frenemy, the chaos-worshipping Ethan Rayne, took Giles out, got him drunk, and somehow turned him into a Fyarl demon, a notoriously dimwitted and violent breed. Since none of his human cohorts could speak Fyarl, Giles had to turn to the electronically gelded Spike for help. Fyarls are humanoid, and look like the Devil: big horns, cloven hooves, etc. The skin is brown, rather than red, and he doesn't have a tail, but still. His skin is thick and rough, so it looks like it would provide a little bit of protection from attacks - especially on the forearms, where it forms a series of overlapping plates. There are bony lumps sticking up off the shoulders, a ridge down the center of the chest, and a fully exposed spine. He's still wearing pants, because television modesty, and of course he's got the hooves (which, for the show's costume, were essentially high heels - something actor Anthony Stewart Head had experience with, from all the times he played Dr. Frank N. Furter on stage). Diamond Select's BtVS toys tried to stay compatible with MAC's, so that means there wasn't a hugh step up in the quality of the articulation. Demon Giles has swivel ankles, hinged knees, V-crotch, swivel waist, swivel wrists, hinged elbows, swivel biceps (cut straight through, not shaped to follow the anatomy at all), swivel shoulders, and a balljointed head. 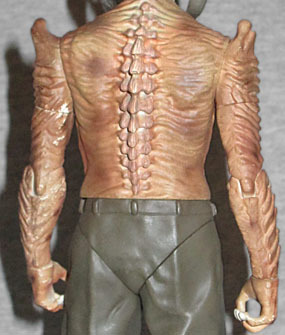 There are ridges along his sides that, if watching SciFi Channel's Face Off has taught me anything, are seams where the front and back halves of the costume are joined together. Unfortunately, between the ridges on his sides and the ridges on his arms, there isn't enough clearance when you're moving the shoulders unless you have everything lined up perfectly. That problem is especially compounded by the paint, which is applied very lightly and scrapes off easily. Very easily. You can really see that on the elbows, which are showing paint wear after less than half a dozen times being moved. Most of the DST Buffy figures came with a display stand - nothing fancy, just a 3½" square bit of floor with a 6¾" wall behind it. Everybody got the same thing, but the details changed to suit each individual. Giles gets a wood grain floor, and a mint green wall. There's an art deco wall sconce, and a small silver hook that would normally be for coats, but because this is Sunnydale, it's got a sword. It's not really clear what this is supposed to represent. Giles' apartment had wood floors and green walls, but not this kind of light fixture. And why is the sword just hanging on the wall, rather than being hidden in some clever stash where civilian visitors won't find it? There are no pegs on the base, but then, neither are there any peg-holes in the feet. 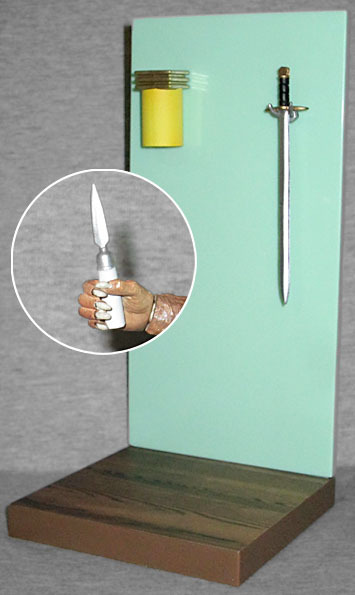 The only other accessory included with the set is the silver letter opener Buffy used to stab Giles in the heart (Fyarl demons being vulnerable to pure silver). The DST Gileses never had as good a likeness as the MAC one, but that was because they couldn't get anything better approved (whether that was because of 20th Century Fox, or it was a case like Sarah Michelle Gellar - where the actor wouldn't okay things that looked right - is unclear). But this figure, being based on stylized makeup, has no such problems. Demon Giles is a terrific take on the character.